Consider the author of these lofty, poetic words: Paul—a man who endured beatings, stonings, shipwrecks, danger, sleepless nights, extreme hunger and thirst, and exposure to the elements (1). Every moment of our lives God is watching over us, working out his plans that will achieve the highest good. Sometimes that includes suffering, for reasons we don’t always understand. 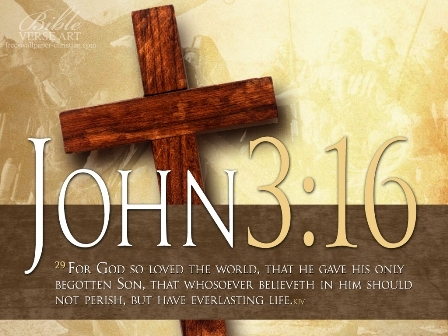 But consider: the greatest tragedy of history, the cruel torture and death of God’s perfect Son on a cross, brought about the most glorious consequence–the eternal salvation of all who believe (2). And when we die? God will still be watching over us (3). Visit a dying Christian and you will be the one encouraged by their God-given peace, joy, and expectation. Long ago, the rabbis believed some angels were grudgingly hostile to men, not wanting to share God with earthly creatures. Perhaps Paul was saying, “Even jealous angels can do nothing to separate us from God’s love” (William Barclay). 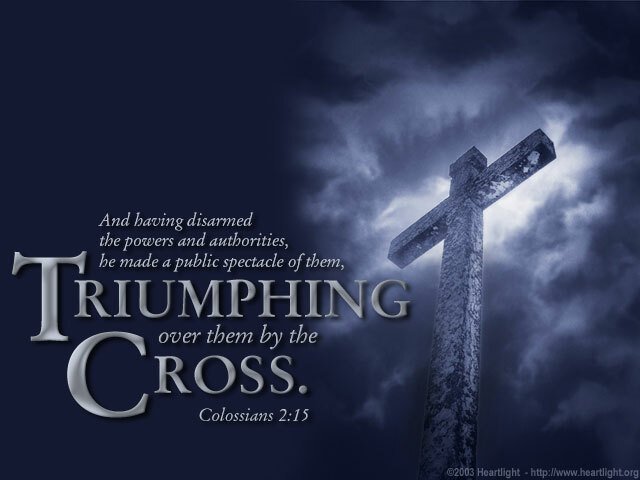 As for demons, they were defeated when Jesus died on the cross (4). Granted, they may prowl around and cause mischief, but they are powerless to sever us from God’s love. Their teeth were removed at Calvary! Sometimes we worry about the future. Will we be able to handle potential calamities down the road? Or, perhaps it’s the present that’s unbearable, and we wonder if better days will ever dawn. But our omniscient God has never been surprised by any turn of events. What he says here (through Paul) is a guaranteed promise: nothing present or future—no circumstance–can separate us from his loving presence. All powers of the universe—whether physical or spiritual—are subject to God, because he alone is the Omnipotent One. No one supersedes him. Many in Paul’s day believed that the star a person was born under controlled that person’s destiny. Height referred to a star’s zenith; depth to the star’s lowest point in the sky. Paul may have been assuring his readers that the stars have no power over our lives. By contrast, our Star of David, Jesus, is like the North Star. He never waxes and wanes; he never changes. And his love is present everywhere (5). 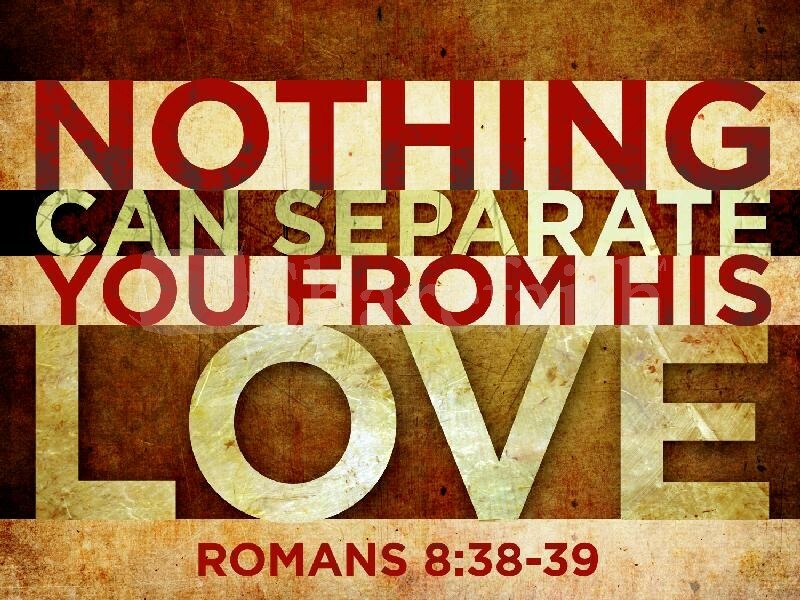 No circumstance, no place, no person can remove us from God’s love. “God never loses his loving grip on his children” (Keith Krell, www.bible.org). And so Paul covered every eventuality that might separate us from the love of God and assured us: It. Can’t. Happen. Surely, if Paul was convinced, after all he suffered, shouldn’t we be convinced as well? Day after day, Father, you express your love to us: forgiving our sins, transforming our spirits, defending us from spiritual enemies, showering us with blessings. We praise you for the warm embrace of your love—a love that spans all time and space, overcomes all pain and suffering, and defeats every foe! “Because your love is better than life, [our] lips will glorify you” (6). 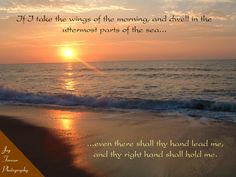 Photo credit: www.doughusen.com; http://www.klove.com; http://www.verseoftheday.com; http://www.pinterest.com. A reminder that never grows old! Praise God for using the post to lift your spirit, Ruth. I had the same reaction to the horror of crucifixion when Steve and I saw Mel Gibson’s film about Jesus. I had to close my eyes at some points. Your insight about Jesus experiencing separation so we would never have to: brilliant. Thank you for that. My heart fills with love, appreciation, and wonder just thinking about it! Wonderfully put together, Nancy. Five times God proved to me that mental illness could not separate me from His love. I was memorizing those scriptures a week before I had a “shut down,” and He brought me through it. Praise God, Nikki, those verses were close to your heart when that trial overtook you. And praise him also that he ALWAYS brings us through the valleys of the shadow of death. I’ve read, “If God brings you to it, he’ll bring you through it.” Such comforting words of loving compassion to cling to! It’s way past my bedtime but one last check of emails and found your blog I had kept to read later. What perfect timing and reassuring verses to lull me to bed tonight. Thanks for such a wonderful bedtime blessing! Praise God these words were a reassuring blessing to you. I pray you had a peaceful night’s sleep, too!